Search For N Finals! 6 Winners & 6 N97! The Search for N competition has finally came to an end. The final round took place a few hours ago when I posted up the clue that led the 10 of the finalists to The Loaf, Pavilion. There were only SIX Nokia N97 to be given away… so the earliest six who arrived got one each… and the last 4 to arrive at the secret location got themselves a consolation prize of a Nokia goodie bag. Contestants ran towards Loaf one by one, welcomed by David, Hazel, Jo and me. Darry… the first person to submit his email the moment the 5th clue was made live few days ago. Ziyan and Calvin got here together… but they were and 6th and 7th to arrive… Since Calvin was in front, Ziyan was very very upset and got kinda pissed… watch the video below to see his reaction. Alex and Christopher were two of the unlucky ones… they arrived 8th and 9th…. Alex’s upset expression was really upsetting.. ahaha Chris was happy all the way eventhough he didnt win.. thats the spirit! The winners were then seated, and briefed about the new Nokia N97.. ordered food.. and played with their new toys while eating. First 3 to arrive got to pick the colour of the N97 they got…. Michael here got the white one… no options.. since he was the 4th to arrive. Thanks Nokia and Text100 for making this happen. Search For N has finally reached it’s peak level! We are now left with 10. Ten very lucky people in Malaysia. 6 of them will be among the first in the world to own the upcoming Nokia N97. Hi all, here are the 10 finalists for Search For N contest. Congratulations for making it to the final leg in the Search for N! You are now just one final step away from uncovering the hidden Nokia N97 in Kuala Lumpur. Here’s the details of the race on 4th June 09 for the 10 of you. I will be posting a clue at 11AM on the said day and all 10 of you will have to decipher it to reveal the secret location (which will be in KL) and rush there IMMEDIATELY. You have 2 hours to rush there (11am – 1pm). The earliest SIX to arrive at the secret location with the password (which has already been sent to you in the congratulations email) will receive the Nokia N97 each. Anyways….. here’s a video of the Nokia N97 being assembled in the factory in Finland and being sent for shipping. Great video. Search for N Clue 5!!! The clue that determines who will be the final 10 contestants! Follow the below format when you are sending the email. Title: I Want To Win The Nokia N97! Leave a comment here once you have sent the email ok? I just wanna know la for fun ahahha. Good Luck! How Does The Search For N work? 2. There will be a total of 5 questions to be answered. The 5th question will be released on June 2nd. 3. As soon as the final question is released, email all five of your answers to nmalaysia@ovi.com. The first 10 all-correct entries will progress to the FINAL stage to stand a chance to win one of six Nokia N97. 4. Nokia will contact the final 10 contestants with a secret password to be used for the FINAL stage. The FINAL CLUE will be posted on 4th June 2009 on http://symbian.smashpop.net (time to be revealed to 10 finalists). 5. Solving the FINAL CLUE will reveal the the secret location of the Nokia N97 where the finalists must immediately proceed to on that day within a specified time. It’ll be an exciting race to the finish because only the FIRST 6 to arrive will receive the Nokia N97. Will you dare to Search for N? If you managed to solve clue #1… congrats. If you managed to solve clue#2… congrats. Now you have to solve clue#3… Good luck. Search for N and win Nokia N97! Nokia is giving out 97 x Nokia N97 worldwide to 97 lucky people! For Malaysia, SymbianpOp has been appointed to give out the N97 to 6 lucky Malaysians! Join the Search for N to get yourself one of the 6 Nokia flagship touchscreen device now! * Nokia Malaysia (the Organiser) presents the Search for N Contest (“Contest”), starting from May 26 2009 and ending on June 4 2009. * Only participants who submit entries to the nmalaysia@ovi.com email address during the specified Contest period will be eligible for the prize. * This Contest is open to all Malaysian individuals aged 18 and above. Employees, agents, employees of advertising agencies and suppliers of Nokia Malaysia and their immediate family members are not eligible to participate in the Online Contest. o Participants must surf over to http://symbian.smashpop.net. Where one question will be released at a set schedule beginning May 26th. o There will be a total of 5 questions to be answered. The 5th question will be released on June 2nd. o As soon as the 5th question is released, participants must email all five of their answers to nmalaysia@ovi.com. o The first 10 all-correct entries will progress to the final stage to stand a chance to win one of six Nokia N97s. o Nokia will contact the final 10 contestants with a secret password to be used for the final stage. The final clue will be posted on 4th June 2009 on http://symbian.smashpop.net. o Participants must solve the final clue which will reveal the the secret location of the Nokia N97. Finalists must immediately proceed to the location on the same day within a specified time. o The first six participants to arrive at the secret location will receive a Nokia N97. * Participants may submit as many entries as they like. * Nokia Malaysia is offering one unit of Nokia N97 each as the prize for the six winners. The prize is not transferable and cannot be exchanged for cash or items of equivalent value, except at the sole discretion of the Organiser. The Organiser reserves the right to substitute or replace the prize from time to time without prior notice. * The selected 10 finalists will be notified by phone or email and be given the secret password as well as details on the final stage of the contest. * If a finalist is unable to participate in the final stage of the contest, the Organiser reserves the right to select another finalist from its pool of qualifying finalists. * The Organiser reserves the right to reject entries that are found or in the opinion of the Organiser to be fraudulent. * The Organiser’s decision is final and binding. No correspondence or appeals against any decision made shall be entertained. * The Organiser reserves the right at its absolute discretion to change, delete or add to any of these Terms & Conditions and/or to terminate, suspend or cancel this Contest at any time with or without prior notice. For the avoidance of doubt – termination, suspension or cancellation of the Contest shall not entitle the participants or the prize winner to claim for compensation against Nokia Malaysia for any and all losses or damages suffered or incurred by the participants or the prize winner as a direct or indirect result of the act of termination, suspension or cancellation. * The Organiser reserves the right to publish or display the name, information and/ or photographs of the winner for marketing, advertising and publicity purposes in any manner it deems appropriate. * By participating in this Contest, it is deemed that the participants agree to be bound by all of these Terms & Conditions and the decisions of the Organiser in relation to every aspect of the Contest. * All participants’ information provided shall become the property of Nokia Malaysia and may be used for but not limited to the following purposes: marketing communications, marketing analysis, or third party offers. * This Contest is carried out to further promote Nokia Malaysia and its products. It is not designed for any gambling purposes. Are U Ready to Search For N? 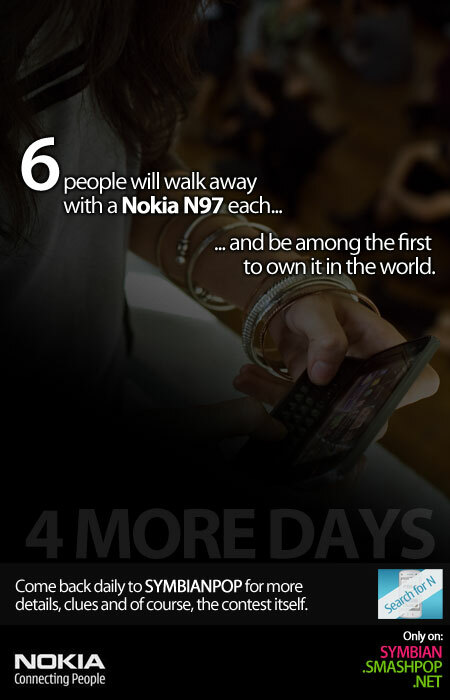 Tomorrow is the day… when 6 people in Malaysia will get the chance to win a Nokia N97 each. Be sure to come back tomorrow if you wanna be part of this. Here’s a video to get you excited. So… white or black N97? Hahaha.. just a random question. 6 Nokia N97 To Be Won! If you have seen the previous teaser, I’m sure you know there will be a contest coming up here on SymbianpOp. Now here’s the second teaser for you. More info now. Are you excited? I am very excited. 6 lucky people will get to own the Nokia N97 a lot lot lot earlier than everybody else. Be sure to keep it logged on to symbian.smashpop.net for your chance to win the upcoming Nokia flagship device!